CD review: "Always, Never and Forever"
This review first appeared in the March 5, 1993 issue of the North County Blade-Citizen (now North County Times). Before there was a New Age movement, before there existed Windham Hill Records, there was Oregon, an eclectic quartet playing mostly acoustic music, based loosely on jazz and incorporating rhythms, harmonies and themes  not to mention instruments  from across the globe. Twenty years after its founding, nearly 10 years since the death of founder/composer/percussionist Collin Walcott, Oregon is still pushing the edge of the music forward, challenging our notions of just what it is that defines jazz. 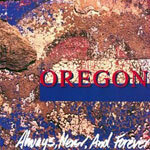 "Always, Never and Forever" continues the Oregon tradition of excellent musicianship married to intriguing compositions. Ralph Towner remains one of the most interesting guitarists in jazz, with fluid lines coupled to syncopated rhythms. Paul McCandless' reed work is among the best, and Trilok Gurtu's percussion, especially on tabla (which Walcott made a trademark part of Oregon's sound) is top-notch. This is as good an album as Oregon has put out. If you like world beat rhythms, jazz improvisation and stellar ensemble playing, Oregon is a group you need to check out.